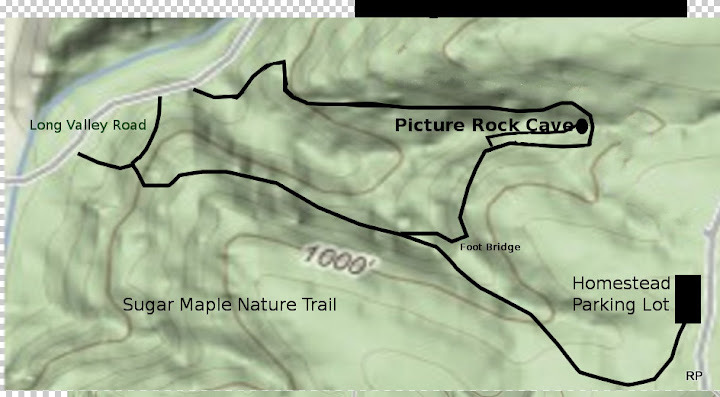 Sugar Maple Nature Trail reconstruction is, officially, underway. Parts of try Sugar Maple Nature trail were lost in July, 2007, due to massive rainfall over a short period of time. Reconstruction is beginning on the lower part of the trail at Long Valley Road. Modern machinery, designed for minimal impact, is used when possible. Hand tools are still being used. Trail reconstruction follows the contour of hills. Members of the Wisconsin Department of Natural Resources trail crew emphasized that the new parts of the trail allow for minimal trail maintenance. When maintenance is needed, access to the trail will be easier. Blue marker ribbons reveal new sections yet to be constructed. 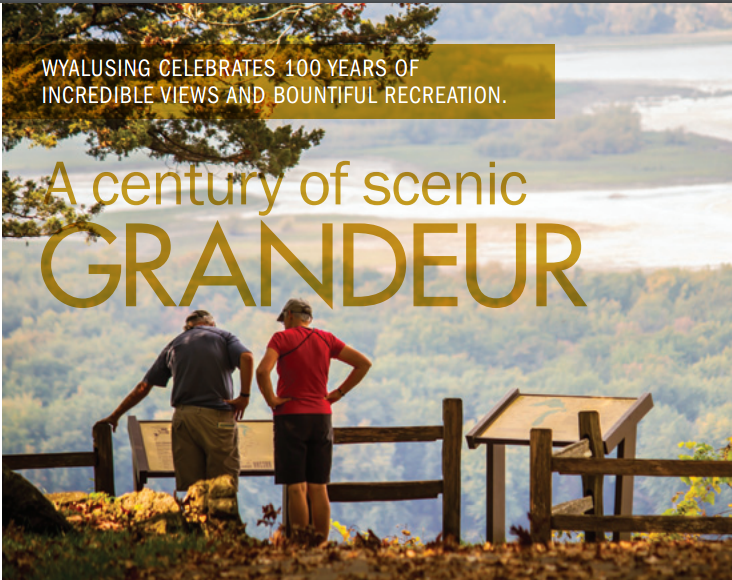 The new pathway will still reveal vistas of the valley and the Mississippi River. Additional Sugar Maple Nature Trail reconstruction photos are found here. First short movie of trail reconstruction here. Werner Bierbach of Muskego, WI, will entertain his audience with cowboy and campfire songs at the Peterson Shelter, Saturday, October 18. 2008, at 7:00 P.M. Mr. Bierbach is camping at Wisconsin Ridge campground this week. Come early. View the leaves at peak color. Bring a picnic supper, and candle. Enjoy Wyalusng State Park at Dusk. Enjoy the fireplace in Peterson Shelter. All are encouraged and invited to attend. See Photos. Can you Identify These Photos? Help is still needed to identify the location where these photos were taken. The photos were taken in the late 1930's and early 40's. Additional early photos can be found here. The Friends of Wyalusing State Park Blog is always looking for vintage photos of Wyalusing State Park. If you are willing to share, please use the email link found below this blog. The original office building will be undergoing internal changes. Plans for a multi-use room are being developed. Watch this space for future developments. The Madison Area Volkssport Association and the Greater Des Moines Volkssport Association are hosting a weekend of walking that features the historic city of Prairie du Chien, Wisconsin and two exceptional state parks: Pikes Peak State Park in Iowa and Wyalusing State Park in Wisconsin. The weekend is all about the Mississippi and Wisconsin Rivers. This area is rich in natural beauty and cultural history. The two state parks lie across the Mississippi River from each other at the confluence with the Wisconsin River. Details are found here. The next meeting will be Nov 10th at 6:30 at the park office. 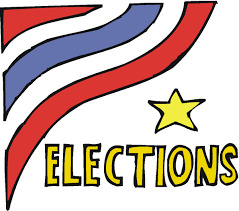 Some of the highlights will be the election of officers and discussion of events and activities for next year. As always, members can contact us by email or snail mail if they can't make the meetings but have comments to forward to the group.